Perhaps no chapters in the Scriptures have stirred the debate over God’s providence and sovereignty in election more than Romans 9-11. Familiarity with these chapters is crucial to the doctrine of election and the future of Israel. As such, these chapters have been taught, studied, and re-taught by nearly every strand of the Christian tradition. In a departure from the common rote, Election of the Lesser Son: Paul’s Lament-Midrash in Romans 9-11 (henceforth Lesser Son) pastor-scholar David Wallace provides a detailed look at Paul’s major theme(s) of the epistle to the Romans and how the these pertinent chapters feed into Paul’s conclusion in Romans 12. Using a thorough and scholarly method, Wallace shows that Paul’s “midrash style” in these chapters puts forth a defense of God’s merciful election of “Jacob—the son in the ‘lesser’ position” as a merciful decision that is “also merciful to Esau” (237). Avoiding the common approaches that result in sharp disagreements on God’s sovereignty and providence, Lesser Son argues, “when God elects Jacob, he reveals his power through weakness so that all might be shown mercy” (249). This ultimately makes great sense of Paul’s admonitions for humility in Romans 11 (to the Gentiles) and in Romans 12 (to the church in general). Wallace’s presentation is obviously pastoral. Despite the heavy theology and exegesis Lesser Son is written with clarity. Each chapter of Lesser Son works through a portion of Romans 9-11. Moving sequentially through the passage, Wallace provides detailed looks at the midrashic form of the letter and the thematic unity with the rest of the epistle. It is Wallace’s focus on Paul’s midrashic elements that brings the passage to life in a manner demonstrating the continuity of Romans 9-11 and the concluding ethical portions of the epistle. Namely, Wallace emphasizes how God’s mercy and election of the “lesser son” is God’s way of teaching humility and providing grace to the younger (Israel) and older (Gentiles) brother. Of particular note is how this approach highlights God’s character and not just a doctrine of election (68-69). This emphasis sheds light on Paul’s quote of Malachi 1:1-2 (62-73). Wallace demonstrates how Romans 9:24 (quoting Jeremiah 18:1-12) also takes the concept of wrath and judgment as a manner of instructing on God’s merciful character. Other highlights of Lesser Son include the “personification” of righteousness in Romans 9:30-10:3 (112-120), a Roman/Caesar-focused understanding of “the end of the Law is Christ” in Romans 10:4 (121-124), and a lengthy discussion on what Romans 11 teaches about “Israel’s Salvation” (191-210). Each chapter summary is helpful (especially for the lengthy chapter four; 213-221) but become repetitive in light of the grand conclusion contained in chapter six (237-249). 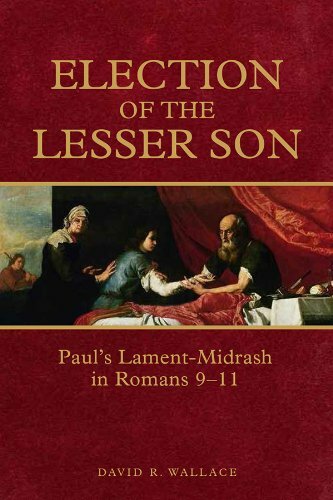 In conclusion, Election of the Lesser Son: Paul’s Lament-Midrash in Romans 9-11 is incredibly valuable as a theological work as well as a commentary on these important chapters of Paul’s writing. Pastors, students, and theologically minded laymen will benefit greatly from Wallace’s work.